"I became a journalist to come as close as possible to the heart of the world." He stood just over six-feet tall, had pale blue eyes and, in his early forties, receding sandy-colored hair, just starting to gray. Although he chain-smoked cigarettes, he rarely drank or ate to excess. Such moderation combined with an overabundance of nervous energy kept him trim. Aside from a habitual seriousness of expression, his most distinctive features were bushy eyebrows. 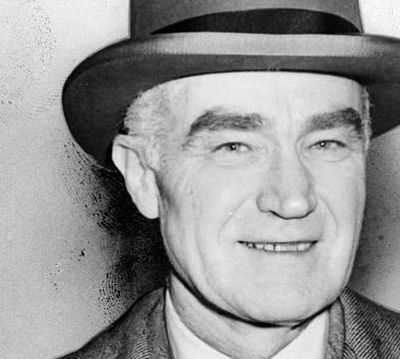 If not so overwhelming as those of such famous contemporaries as labor leader John L. Lewis and Attorney General Frank Murphy, the beetle brows were the physical characteristics that those meeting him for the first time invariably noticed immediately. Newcomers might note, too, odd speech patterns, such as speaking too quickly, his mind racing ahead of his words, or sometimes, a stammer, due to a boyhood speech defect. 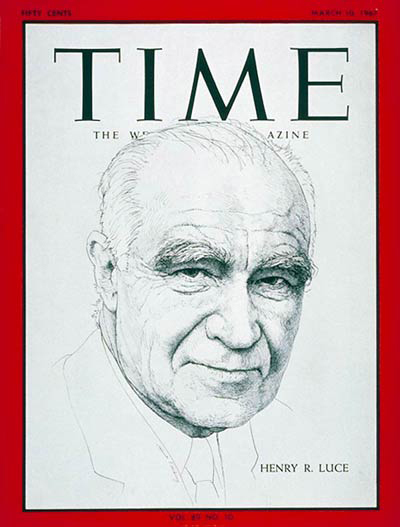 Although up to one out of every five Americans might look at a Luce periodical during a given week, his magazines in 1940 commanded greatest favor among journalists and the middle class. More correspondents in Washington read Time than any other magazine; there and elsewhere many admired and modeled their own work after Time’s peculiar and omniscient mode of news writing. It commanded an audience well outside the federal city. Younger, better-educated members of the middle class had begun to consider Time required reading. Their wealthier neighbors not only took Time, but Fortune, Luce’s lavishly illustrated business monthly. Luce’s concern for the world began with the Second World War. Like many members of the Eastern Establishment – an informal collection of publishers and political and financial leaders – Luce viewed the early victories of Nazi Germany with alarm. No longer, Luce argued, could America afford her traditional isolation from the world. Even if Britain stopped Hitler, Luce correctly surmised, the war would leave her too exhausted to play the great world power. Americans had to be made to accept the “inevitable”: armed intervention to save Europe and a new postwar order dominated by the United States – Luce called it the American Century. Luce’s vision of America hegemony still faced obstacles. Some powerful conservative elements within the Republican party and some newspapers, most notably the Chicago Tribune, fiercely opposed Luce’s new imperialism. Abroad, the Soviet Union began late in the war to assert its own will over Eastern Europe. Even before the disintegration of the U.S.-Soviet alliance. Luce’s magazines, in 1944 and 1945, started to question Russia’s intentions for the postwar world. Stalin, like Hitler, seemed bent on upsetting a balance of power favorable to the United States. Such appraisals can be misleading. Most Americans did not regularly read a Luce magazine; in a given week, far more were likely to scan a daily newspaper and listen to a radio newscast than to examine an issue of Life. Nor did every subscriber absorb whole the arguments in all the articles in each issue. Luce’s publications alone did not frame or structure readers’ view of the world; for many, they served as supplements to friends and neighbors, newspapers, and broadcast news services. These other voices, in turn, often echoed Luce. By the late 1940s, virtually all the popular press shared his hostility toward the Soviet Union. But not all advocated what came to be Luce’s moralistic approach to foreign policy. Nor were Harry’s ardent views on China found in every national and local news service. Nevertheless, rival mass communicators had come to accept the fundamental premises of the American Century. Then, too, Luce’s role was most often limited to that of a publicist, not an initiator, of policies. When the Roosevelt administration refused to place him on a special commission reviewing postwar economic policy, he could only publish, as opposed to participate in, its determinations. Later in the decade, his lobbying for China, under siege from Communist insurgents, went largely unheeded until it served the political needs of Republicans in Congress; they and Luce then watched helplessly as the United States abandoned any attempt to save China from the Communists. In the 1950s and 1960s, Luce received more attention from both Republican and Democratic presidents. Yet they approached him after making decisions, not before. Luce served as an information minister, not foreign secretary. To note the limits of Luce’s power and the representative nature of his opinions is not to diminish the importance of his journalism. His most severe critics would blame him for what he argued. Too conveniently of self-servingly they ignore how many not on Luce’s payroll shared his basic assumptions about the Cold War. It is not, then, so much what information he conveyed as how he did it. Time and Life, and to a lesser extent Fortune and “The March of Time,” helped to change the practices of American journalism. Luce and his collaborators deliberately sought to create new ways of relaying the news. And by succeeding, Luce helped to alter the profession forever. Luce’s career, then, took two stages. The first and more vital involved the evolution of new types of information media, the news magazine, the thoughtful business periodical, the photoweekly. By the very late, 1930s, these inventions had become innovations, popular and profitable. At this point, the publisher began to assume an interest in public affairs. Although still a publisher, never a politician, Luce became a “public man,” more concerned about presidential politics, world affairs, and the quality of life of the American middle class. For him, this second act was more frustrating. Not until his last years did he overcome a restlessness about his works, his country, even his personal life. Yet he never lost the confidence he had as a young man that his journalism could inform millions and hold the modern state together. 1 Robert T. Elson, The World of Time Inc., 2 vols. (New York: Atheneum, 1968-73), 1:447-48. 2 W. Rich to Frank Norris, 5 July 1940. Daniel Longwell Papers, Box 29, Columbia University, New York City. 3 Roosevelt to Luce, 20 November 1940, Roosevelt Papers, President’s Personal File, Roosevelt Library, Hyde Park, New York. 4 Business Week, 6 March 1948, 6; PaulineKael, “Raising Kane,” New Yorker, 27 February 1971, 49-50, 52, 57. 5 Theodore H. White, In Search of History (New York: Harper & Row, 1978), 126. 6 U.S., Congress, Senate, Government Operations Committee, Subcommittee on National Policy Machinery, Organizing for National Security, Hearings, 86th Cong. 2d sess., 1960, 923. 7 Ralph Ingersoll, quoted in “Time: The Weekly Fiction Magazine,” Fact 1 (Jan.-Feb. 1964): 3. 8 Joseph Epstein, Ambition: The Secret Passion (New York: E.P. Dutton, 1980), 147. Compare with Epstein, “Henry Luce and His Time,” Commentary, November 1967, 35-47. 9 W.A. Swanberg, Luce and His Empire (New York: Charles Scribner’s Sons, 1972), 472. 10 Joan Shelley Rubin, “Swift’s Premium Ham: Wiliam Lyon Phelps and Redefinition of Culture,” in Mass Media between the Wars: Perceptions of Cultural Tensions, 1918-1940, ed. Catherine L. Covert and John D. Stevens (Syracuse, N.Y.: Syracuse University Press, 1984), 12. 11 David Cort, “Once Upon a Time Inc.,” Nation, 18 February 1956, 134. 12 Raymond Williams, The Long Revolution (London: Chatto and Windus, 1961); James W. Carey, “The Communications Revolution and Professional Communicator,” Sociological Review Monographs, no. 13 (January 1969), 23-25. 13 William F. Buckley, Jr., The Jewler’s Eye (New York: G.P. Putnam’s Sons, 1968), 340-43. This essay was adapted from the book “Henry R. Luce and the Rise of the American News Media” by James L. Baughman.